Over the past few weeks our area has received over 70 inches of the white stuff, with more on the way next week. Consequently we have spent A LOT of time indoors, unable to leave the house. We have taken turns doing the shopping- depending on whose schedule takes them closer to a food dispensary. Yes, they now out number the pizza supply in the fridge. Will balance ever be restored?! I know I will not be getting his help eating most of the winter vegetable offerings so I am free to prepare them any way I like. 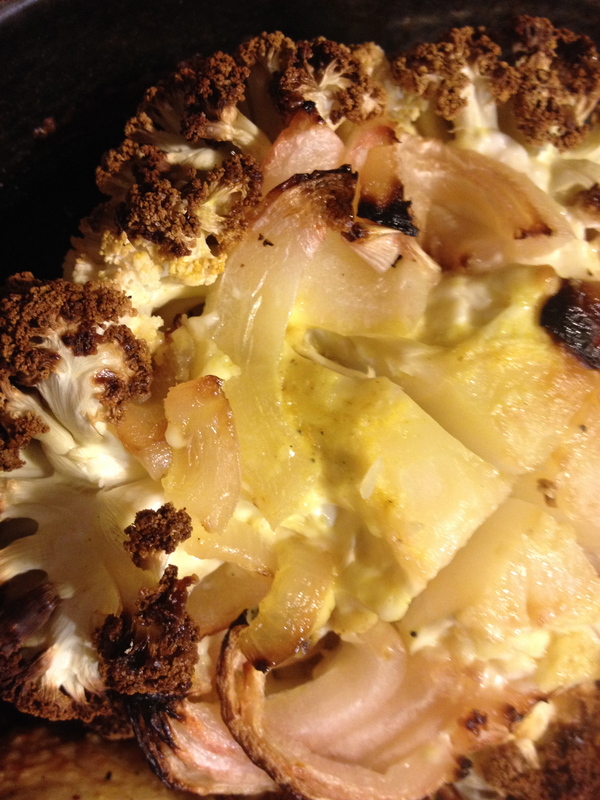 Even though I know dozens of ways to prepare the cauliflower; during long cold days I prefer to roast most things. I like the heat from the oven and the easy preparation, leaving me free to spend my time crafting while yelling at the T.V. 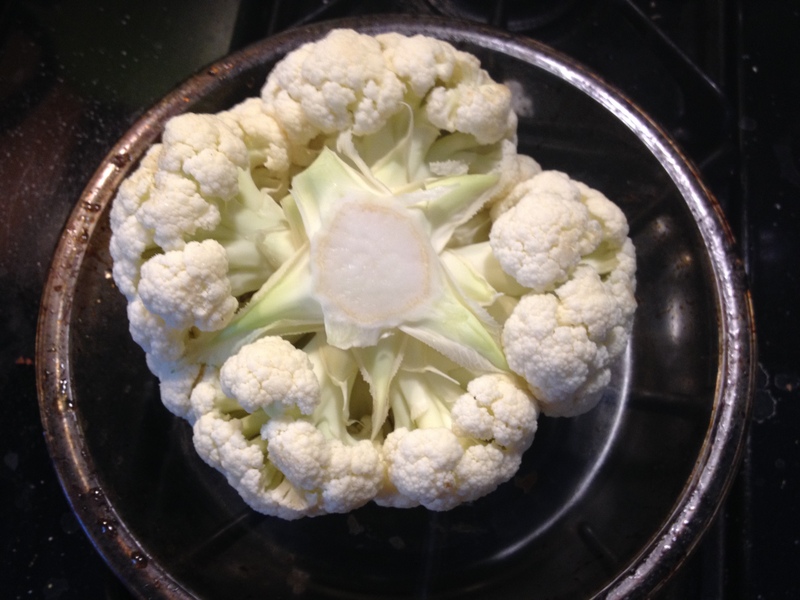 When the head is tuned upside down you can see there is a lot of room in between the florets and the center stalk, this is where I will put my seasoning. I LOVE garlic and so that is where I start: garlic, salt, pepper, onion powder. Dry seasonings work best to get down into the sides of the head. 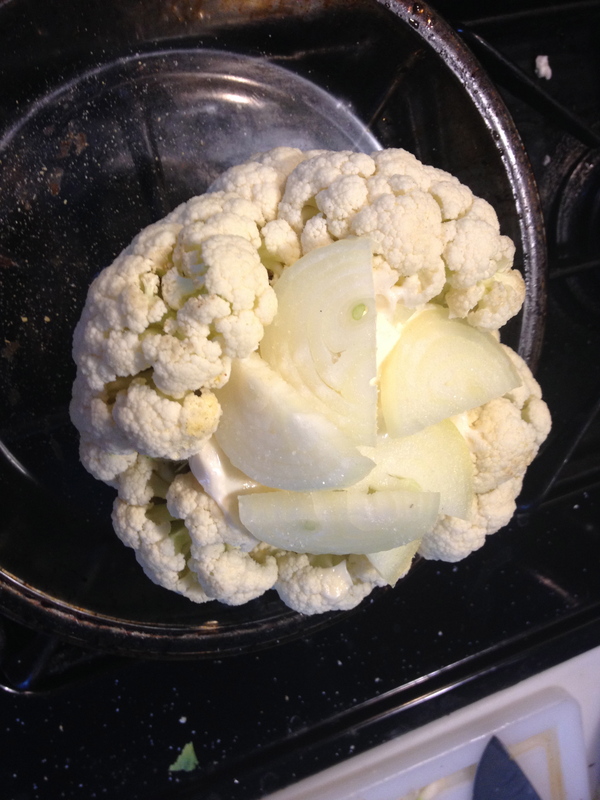 Get them all the way down to the bottom by doing a little shake with your vegetable. 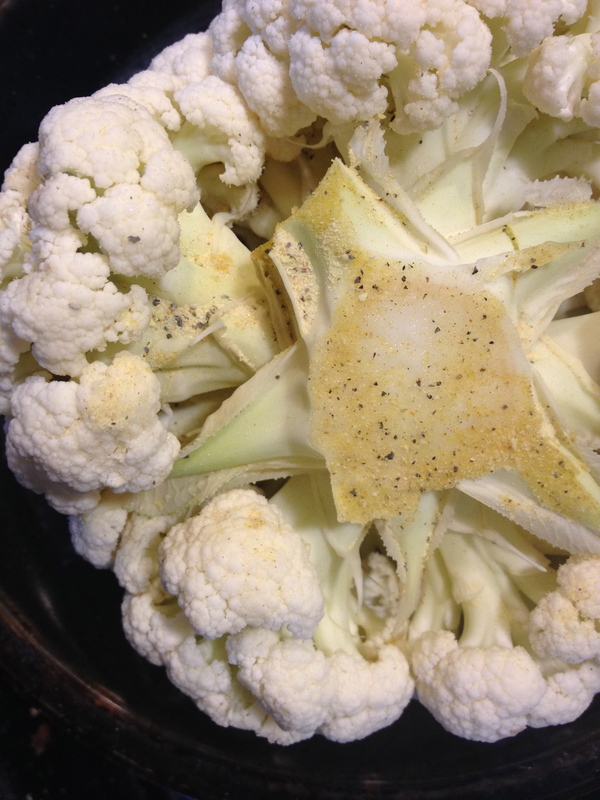 Leaving it whole allows the flavors to be trapped inside the head- seasoning it from the inside out. I take a knife and cut a deep ‘X’ in the stem just so it has a chance at cooking evenly. 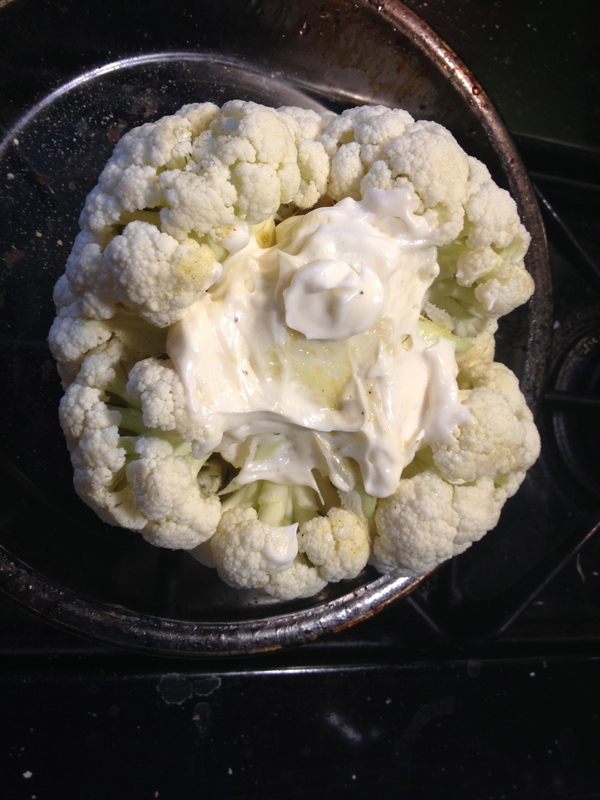 Then it’s time for the fat, you can use anything from olive oil to butter or mayo. You can use as much or as little as you want. The fat helps it cook and caramelize. I have no doubt you could just add a little water to the inside and bottom of the pan and get a steam roasted result but where is the fun in that? This is about 2 Tbsp of mayo speed over top of the catacombs. 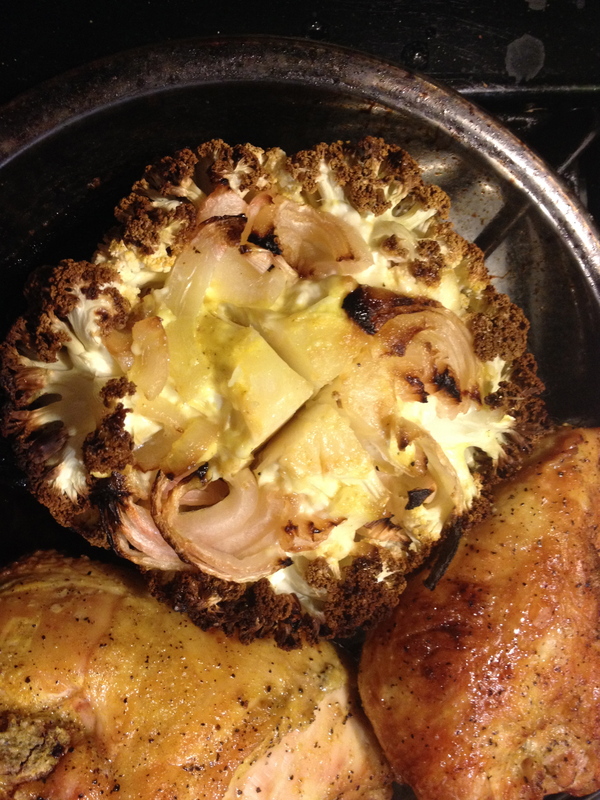 Then I added sliced onion as a little lid so that my creation will not dry out in the oven. After a little over an hour I checked on it to make sure it’s not getting too crispy on the outside. This is what you want to see. 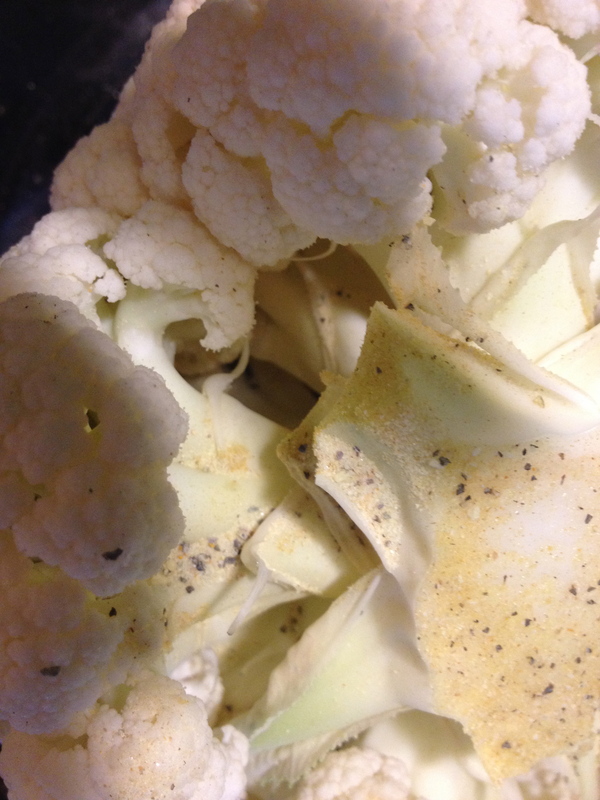 Good color, on the outside and the flesh of the cauliflower going from stark white to a transparent cream color and that ‘X’ starting to split apart in the stem. I can tell when it’s done just like I would with a baked potato. When I can stick a knife or fork in the center and it goes in with ease and comes out the same way, I pull it from the oven. Mine took around an hour and a half but this will depend on the size of the head. Covered resting is important to evenly distribute the remaining heat and let carry-over cooking merry all the flavors together. We (I) ate it with bone-in roasted chicken breast and it was awesome, plus I have half the head leftover for tomorrow. It would turn into soup with almost no work at all but we will see what the weather brings. Maybe we will be able to go outside for more than a few minutes without freezing and I will turn into a salad and we can have a picnic! But probably not. I Lied. The Digging-Out Is The Hardest Part. Creepy Lobster Trap Valentine Tree Anyone? *divine* I meant to say, but perhaps mayo is diving onto it? !